Researchers used data from the Fermi Gamma-ray Space Telescope among other sources to search for signs of dark matter structures called ultracompact minihalos, whose existence or nonexistence illuminate conditions in the early universe. 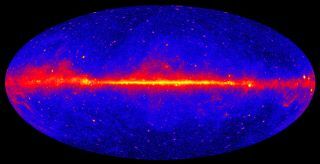 Here, five years of data is shown from Fermi. Two of cosmology's greatest mysteries — dark matter, and the expansion of the early universe — are tied together in a new study, which searches for small, dense knots of one to understand the other. Although it hasn't been detected directly, researchers think dark matter may make up a substantial portion of the universe's mass. Much of it forms in large halos around galaxies, including the Milky Way, and researchers observe its impact through the galaxies' gravitational pull. "What we did for the first time was connect the ultracompact dark structures in the universe and their possible existence to inflation itself," said Layne Price, a physicist at Carnegie Mellon University in Pittsburgh and co-author on the new work, which was published today (Sept. 28) in the journal Physical Review Letters. "These ultracompact minihalos could have formed, but they didn't," Price told Space.com. "And the fact that they didn't form tells us something about the structure of the early universe." Inflation is the mysterious force that blew up the scale of the infant universe from sub-microscopic to gargantuan in a fraction of a second. See how cosmic inflation theory for the Big Bang and universe's expansion works in this Space.com infographic. There are many different models to describe how inflation happened, and any detail researchers can glean left over from that time helps narrow down which are more accurate. Although some models of inflation would allow for conditions to create the minihalos, Price said, the researchers couldn't find any trace of their gravitational pull or potential gamma-ray creation — suggesting the early universe didn't have dense enough pockets of matter to create them. "Inflation predicts that you get a largely homogeneous and flat universe; a perfectly flat universe, very few bumps and wiggles in the local density of stuff in the universe," Price said. "But it will tell you that you get little bumps and wiggles that are local changes to this, and the amplitude and size of these wiggles is given to you by the details of inflation." To search for the minihalos, the researchers took two tacks. The first considered pulsars: regularly blinking neutron stars that act as "cosmic clocks." As minihalos passed between Earth and the pulsars, they'd create a distinctive signature in the highly predictable pulsar data. The second strategy relied on the fact that the minihalos would be incredibly dense. While dark matter doesn't seem to interact with ordinary matter, some models suggest that it can interact with itself to generate gamma-rays, Price said. Because of the minihalos' density, they would be more likely to generate that signal. Using data from pulsar timing arrays, and from the Fermi Gamma-ray Space Telescope, the researchers concluded that there was no sign of the minihalos that could have been left over from the universe's early days — meaning that inflation must have proceeded within certain constraints, without creating any spots dense enough to build them. Combining those constraints with analysis of the cosmic microwave background let the researchers put tighter bounds than ever on what inflation was like. For instance, if during inflation the universe had many more random fluctuations on small scale than large, it would match what's predicted by the cosmic microwave background — but then minihalos would have formed, too, so researchers can eliminate that scenario in models. It could also be useful if minihaloes are ultimately found, Chary said. "If a clear signature of UCHMs [the minihalos] is obtained in pulsar timing data, then this analysis shows that we may get some interesting insights on the inflationary potential," he told Space.com in an email. "But nature tends to be rather imaginative — so without better observational data, the implications are very much up in the air." More observations and more detailed models will both help researchers solidify limits on the universe's inflation, Price said. Continuing to develop the theory, and creating very precise simulations of minihalo formation and how early it could have occurred, could help push knowledge of that early universe even further. "We don't quite know what dark matter is, we don't quite know how inflation happens, but even given this uncertainty we can utilize both of them together to constrain the physics of the early universe," Price said.